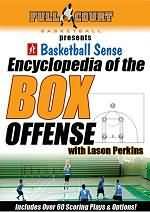 This article is the third in a series of four articles on basketball's Box-set offense and coach Lason Perkins' excellent DVD on the Box offense. Coach Perkins at this writing resides in Cary, NC and coaches basketball at Cary Academy. Lason Perkins is recognized globally as one of basketball's brightest coaching minds. He has coached at every level of basketball from elementary school to the professional ranks, and is the creator of many instructional basketball videos. He is a great student of the game with an expert understanding of Xs and Os, and maintains contact with coaches from around the world. The ball-screen (pick and roll) is very popular currently. 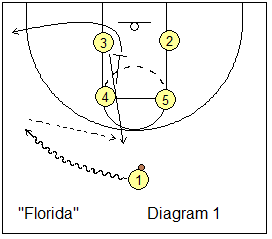 The following box-set plays utilize the pick and roll. Diagram 1 shows the basic box set. O2 and O3 cross to opposite corners. O4 pops out just outside the left elbow and gets the pass from O1. O1 cuts around O4 who fakes a hand-off to O1, but keeps the ball. O1 moves to the left wing (diagram 2). 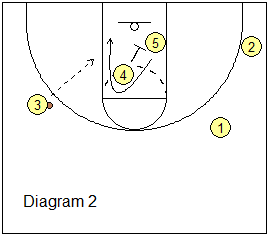 O5 then sets a ball-screen for O4. 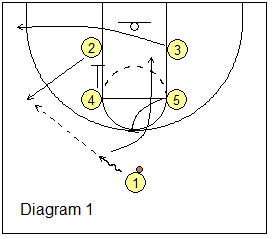 O4 and O5 execute the pick and roll (diagram 3). O4 looks to score or pass to O5 rolling inside, or to our best shooter O2 in the corner. Diagram 1 shows O5 and O4 setting down-screens for O3 and O2. O2 cuts out to the left wing, and O3 goes to the right wing and receives the pass from O1. O1 down-screens for O4 (diagram 2). After screening, O1 moves out to the left corner. 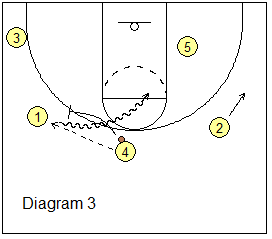 O4 cuts up to set a ball-screen for O3. O5 moves to the left block. 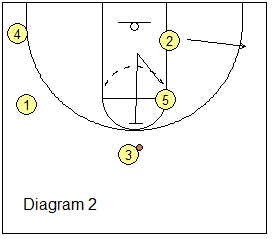 O3 and O4 run the pick and roll (diagram 3). 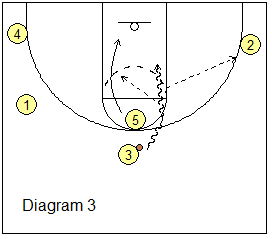 Depending on O4's skill set, he/she can either roll to the hoop or pop out to the arc. O3 looks to score, but also has passing options to all four players. Diagram 1 shows O5 and O4 setting down-screens for O2 and O3. O2 cuts out to the left wing, and O3 goes to the right wing and receives the pass from O1. O1 moves to the left wing, and O2 drops down to the left corner (diagram 2). O4 moves to the left block. 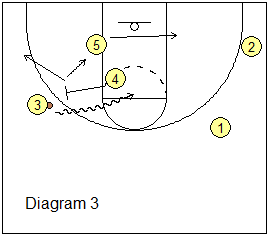 O5 sets a ball-screen for O3, and O3 and O5 run the pick and roll. 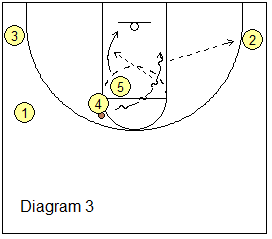 Again, depending on O5's skill set, he/she either rolls to the hoop, or pops out to the arc. O3 looks to score, but also has multiple passing, kick-out options. 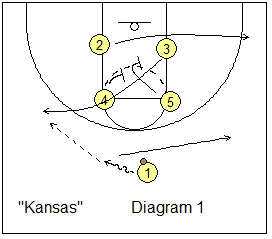 Coach Bill Self has used this play at Kansas. Diagram 1 shows O2 cutting to the right corner. O5 and O4 set a double staggered screen for O3. O3 cuts over the double screen to the left wing and gets the pass from O1. O1 moves to the right wing. O4 down-screens for O5 (diagram 2), and O5 curls around the screen. O3 could pass to O5 here. 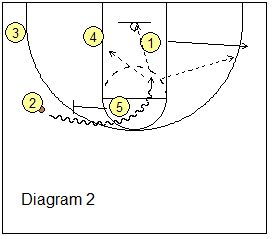 If O5 is not open, he/she moves to the right block (diagram 3), and O4 sets a ball-screen for O3. 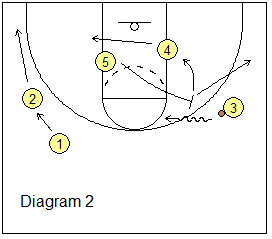 O3 and O4 run the pick and roll. O3 looks to score, but also has passing kick-out options to all four teammates. Diagram 1 shows O1 dribbles to the left wing, as O4 down-screens for O3. O4 then moves to the left corner, and O3 cuts to the top for the pass from O1. 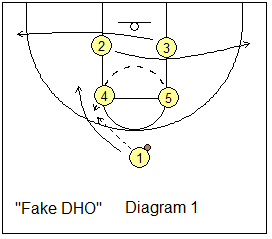 O5 fakes screening for O2 (diagram 2),and cuts back up to ball-screen for O3. O2 moves to the right corner. 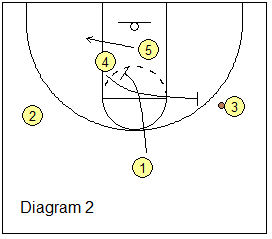 O3 and O5 run the pick and roll. We have a kick-out option to our best shooter O2. Diagram 1 shows O4 down-screens for O2 and O2 cuts to the left wing. O3 cuts out to the left corner. O1 passes to O2. 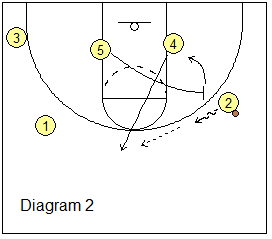 O5 moves to the mid-line and back-screens for O1. 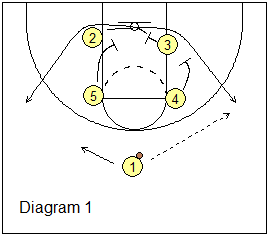 O1 basket-cuts around O5, and if O1 is open, O2 makes the lob pass to O1 for a lay-up. 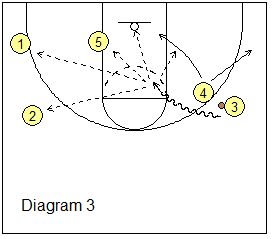 But assuming that pass is not open, O1 clears out to the right corner, and O5 ball-screens for O2 (diagram 2). O2 looks to turn the corner and attack, as O5 pops out to the arc (we already have O4 inside). O2 could also have possible passes to O4 or O1 for shots. Diagram 1 shows O4 and O5 set down-screens for O2 and O3. O2 and O3 cross underneath and cut out to the wings. O2 cuts first and underneath O3. 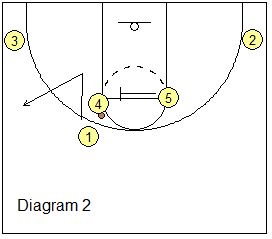 O1 passes to O2 on the right wing, and O1 moves to the left wing. O4 cuts up to the top (diagram 2). 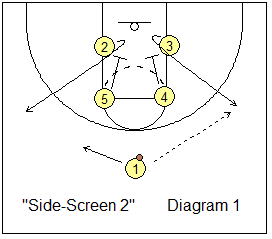 O5 ball-screens for O2 and rolls to the hoop after screening. If O2 is not able to penetrate, he/she passes to O4. 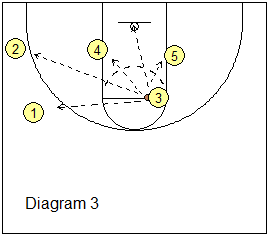 O4 passes to O1 (diagram 3), follows the pass and ball-screens for O1. O1 attacks looking to score, as O4 pops out to the arc after screening. Get more Box-Set Plays in the Premium Members section and the Playbook download. 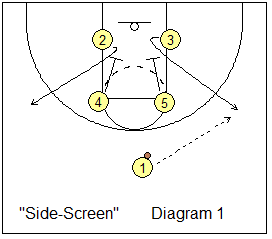 It also includes "Lob" and "Side-Screen #2".